The final changes to line ups have now been made – please see our final SPR Tour of Margaret River teams entered for 2016.
el Prez has created a new FaceBook page and invited all our competitors, aimed at being a central point of contact in the lead up and during the ToMR event. At present, there is the ToMR Official Riders guide uploaded for your reference. Make sure you are familiar with the rules, regulations and requirements of the event prior to arriving on Thursday night. Pete has also constructed an SPR riders guide, covering your accommodation locations, access codes for the houses, event locations, start times and likely travel times. This is a guide only so you’ll need to ensure that your preparation and travel times are in place for yourselves. Previously, SPR houses have arranged group meals for dinners, and had a nice ol’ full team BBQ cook up on the last evening. And this year is no different. Saturday night we’ll be gathering at one of the team houses for a meal together. It’s a “bring your own meat and a salad or plate to share”, and we’ll chow down somewhere in between war stories and tales of unsubstantiated heroics. Standby for details on the FB page. In terms of food, be aware Margaret River has limited supplies, and near 1000 cyclists descending on the area. You may have heard of the Great Banana Crisis of November 2015…. Be prepared. For now, standby for the SPR Competitor Guide. It was great to see our TTT efforts over the weekend, and thank you to those that could make it. We will seek to be doing the same over the next few Saturday’s as well, but I encourage you to coordinate with your teams individually as well – you all have up to date email contacts sent out last week of your fellow team members. Any outstanding final payments please advise me ASAP by email, unless you’ve already discussed with me. We are in the process of allocating houses at present will have some further details out later this week. We are also generating a ride guide for getting to and from accommodation, to and from the individual race locations, and details on the traditional SPR House BBQ for the Saturday night. Next weekend we will be kicking off some organised TTT practice sessions in our teams. We’ll follow these up for the next few weeks to make sure we’re dialed in!The time has come your for final payments. For those that have paid their $100 deposit and received a receipt for this, please proceed to the SPR website shop and make your final payment. 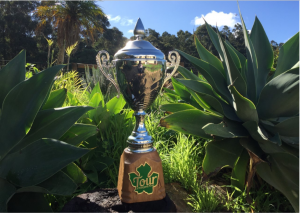 Purchase the item “2016 Tour of Margaret River Final Payment” at a cost of $530. If you HAVE NOT paid a deposit (and some of our reserves have not as they nominated late) you will need to pay in full. Purchase the two items “2016 Tour of Margaret River Deposit” and “2016 Tour of Margaret River Final Payment” at a total cost of $630. The final accommodation payments are due from the Club soon, so your final payments are due by Sunday 16th October. Please ensure you pay these in time. For those of you that are currently reserves, please await confirmation of selection prior to making payments, or email the Race Committee to discuss. Deposits are done and reconciled and thank you for getting those paid. We have had some movements in the team make ups in this process with several dropouts. 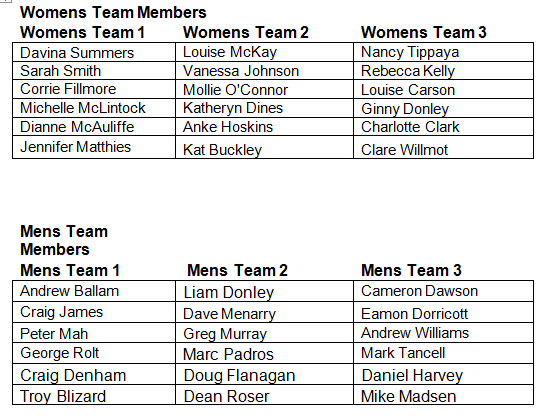 Currently there is one reserve across the Women’s teams and now we have a soon to be confirmed full house for the men’s, hence the empty space at present. Next payments will be due soon, with the SPR Shop item going active soon – an email will be sent to advise you all. Final reminders for SPR Club Kit purchases. There is an order open at present which will close on 30th September. This is due to be delivered especially in time for the ToMR, and you MUST be riding in the current, Cycling Australia registered jersey to compete. Get your orders in here. Next weekend on the Saturday morning ride we will look to do a TTT get together during the Saturday Morning Main rides. Anyone unable to attend, or on a different program, drop me an email at the Race Committee email address. Money money money money. It’s not all about the money. We’re currently reconciling the deposits that were due 31/8/2016. Many thanks for getting these in on time, despite some of the challenges we had reported in making the payment. If you had any issues getting this paid, please contact race@southperthrouleurs.com.au asap. Final payments will be due by the end of September – that’s a $530 balance for each rider. So standby for notice of the SPR Shop window opening. 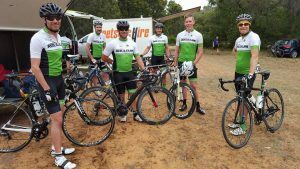 With Collie Donnybrook done and those fast legs having qualified for the Gran Fondo World Champs, we now have the Pinjarra Classic and Beverley Handicap upcoming – it’s time to really get racing. There will be a Pinjarra Classic Blog post published tomorrow. We are progressing and things now start to get serious – monie$. The accommodation has been booked for 6 teams in 6 houses that are pretty swish. Accommodation has been booked and costs confirmed – accommodation is inclusive of 3 nights – Thursday, Friday and Saturday nights. There is a $100 deposit for your registration fee now required is required to retain your place on the nominee list. The SPR Shop has the item added and riders must pay this deposit by Midnight Wednesday 31st August. SPR Shop is here. The balance of registration and accommodation will be due by Sunday 25th September, and a new SPR shop item will be up for that later payment. Please ensure you pay on time – with information in the lead up to be posted. Any queries, get in quickly to race@southperthrouleurs.com.au. Please note that if you need to withdraw, we will be able to offer refunds up until 25th September. After this time, only if we are able to fill the space will a transfer of the monies be possible. All riders MUST hold a current Racing License with Cycling Australia. If you don’t have one, you’ll need to get one here. 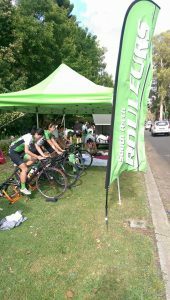 You MUST race in the current Cycling Australia registered SPR kit. If you need some, start getting organised. The next Club Kit purchase should get it here just in time. No kit – no race. Get your Green on here. Thanks for your interest and welcome to Tour of Margaret River, the biggest and best amateur teams race event in WA, SPR style. Registration fees are $330 per racer and this is paid by you, the rider. Accommodation for 3 nights in pretty nice digs, approximately $250-$300 (still being finalised). Self-transportation – so your fuel or shared fuel costs if car-pooling. Attendance as a team to some additional Training Sessions, as we have done in previous years eg. Team Time Trial practices along Shelley. The Club supports these events, and is indeed hosting two of them – the Beverley Handicap (a brand new event by SPR) and the SPR Water Tower Challenge. So we need you to support them too. And as with previous years, SPR will be subsidising some of the support costs for this year’s ToMR event. There will be a deposit requested for your event registration of $100 appearing soon in the SPR Shop. The balance of registration and accommodation will be due at a later date TBA – likely mid/late September. If you need to withdraw, we will be able to offer refunds of 17th September. After this time, only if we are able to fill the space will a transfer of the monies be possible. Should you have questions, queries, clarifications or concerns regarding ToMR, costs and the lead up to the event, please raise them with the APRC as soon as possible via email at race@southperthrouleurs.com.au.